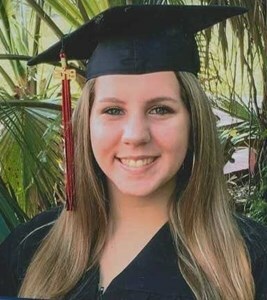 Jana Nicole Burke, age 17, of Orlando, FL unexpectedly passed away on Monday, January 28, 2019. Jana was born on July 3, 2001 in Orlando, FL, to parents, Kathleen Mary Burke and John Joseph Burke. Besides her parents, she is survived by her loving sisters, Kaitlyn Marie Burke and Christin Lee Burke; and many loving aunts, uncles, cousins and friends. She was preceded in death by Grandpa Thomas, Grandma Barbara, Pop Michael and Nanny Eileen. Jana was a happy - go- lucky, beautiful soul who enjoyed her family. Jana's last request is for everyone to "remember me with a giggle and a smile". Mommy, Daddy, Kaitlyn and Christin, I will see you soon. Visitation will be on Friday, February 1, 2019 from 5:00 pm to 9:00 pm at Newcomer Funeral Home - East Orlando Chapel, 895 S. Goldenrod Road, Orlando, Florida 32822. Funeral Services will be on Saturday, February 2, 2019 at 11:00 am at Newcomer Funeral Home with Deacon Don Warner, officiating. Burial will follow at Drawdy-Rouse Cemetery. To share your memories of Jana or leave a special condolence message for her family, please click the Share Memories button above. Add your memories to the guest book of Jana Burke. Jana, Jana, Jana. Words will never be able to describe how much I love you. I had the privilege to grow up with you right next to me. Whatever I did you were right there. I would go hang out with Jon and you would come. I can still hear those little flip flops, flopping behind me. We shared a room together for oh so long. If you got scared you'd come to me and wake me up. We would cuddle and watch movies. If I cried you'd be at my bedside wiping my tears away. We would hide under our blankets at night playing our Nintendo DS games and you begging me to play the games I hate the most "just one more time, pleaseeee". Then we grew up and we would send each other close up pictures of ourselves through snapchat and laugh so hard, even though we were across the room. All the inside jokes we had and the time we just tormented Kaitlyn about her toes. You were always the person I came to with any problem I had, no matter how big or small it was, you just knew what to say. We spent so much time together. When we got older, we would spend our afternoons driving around all of East Orlando to see your friends and mine. We would laugh and sing all of your favorite songs at the top of our lungs. We would go shopping, and stop and get food, most of the time you'd just order a cheeseburger with only pickles on it, so I had to make sure wherever we went had what you would eat. Or all the times I would drive an hour just to visit you. All the times I was there to wipe your tears from stupid boys to you just being stressed. You were my best friend, my right hand, my go to. I know you are watching over me. And I know you are in a better place. But I miss you oh so much, baby girl. I hope you are in no more pain, and I hope you come visit me soon. My deepest condolences to your family. Jana was a beautiful soul and her kindness will be remembered forever. I’m so extremely grateful my son had a pleasure of calling Jana his friend since 1st grade. Rest In Peace, sweetheart. The right words can be so hard to find. Simply know that I'm praying for Jana and her families at this most difficult time. Jana will always be with you in a way that only you can feel, a way that will give you strength when you need it the most. Our thoughts and prayers are with you now and always. Our deepest condolences for your loss. May Jana rest in peace among the angels and may your memories always warm your heart and make you smile.Our love ,thoughts, and prayers from your Jersey Shore friends. Kathleen, Kaitlyn & Christin- my prayers & love to you all for the loss of your daughter & sister. May all the loving memories of Jana comfort you & bring you peace. Jana was always a good friend of mine growing up , we lived a few houses away from each other . She was always a bright beautiful soul . Although we grew apart our memories will remain forever ?? Rest In Peace beautiful. My deepest condolences for your family . My deepest sympathies to your mom, dad, sisters and family. Rest In Peace in God’s loving arms.